Apple may not have a physical presence at this week’s Mobile World Congress (MWC) in Barcelona, but the company’s influence can be seen everywhere. Not least in Nokia’s newly announced third-party application store. The Ovi Store will offer “a range of content including applications, games, videos, widgets, podcasts, location-based applications and personalised content”, and will be available on both S60 and Series 40 devices. 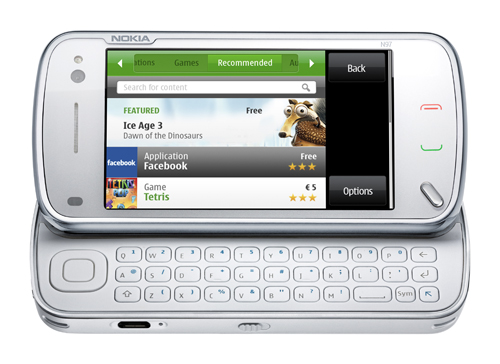 The first handset to ship with the store pre-installed will be the recently announced Nokia N97, which is set to launch by June. Sensibly, Nokia will also make the Ovi Store available to existing S60 and Series 40 handsets through a simple download in May. Revenue from paid-for apps will be split 70/30 in the developer’s favor, exactly the same deal offered by the iPhone’s App Store. All very Apple-esqe, so far. However, here’s where Nokia is at least attempting to be different: “Ovi Store is unique in its ability to target content based on where you are, when you’re there, why you are where you are and who else has downloaded similar content”, all of which fits perfectly with the company’s ambitious Social Location (SoLo) strategy. Interestingly, both MySpace and Facebook are cited as early partners, with each social networking site set to offer a dedicated app when the Ovi Store launches. While this in itself feels like Nokia playing catchup, it’s very much needed and is a nod in the right direction in terms of the company not putting all of its social networking eggs in one basket. Having said that, an official S60 Facebook app on its own is unlikely to result in the social network being fully integrated into Nokia handsets, INQ1 and Palm Pre-style, as rumors have suggested. From today, content publishers will be able to register for the Ovi Store at publish.ovi.com. Developers and publishers will then be able to upload content starting next month, in time for the May launch.